Sesame coated haloumi cheese with a crispy salad and balsamic dressing. Slice the radishes very finely – you can use a potato peeler. Slice the cucumber finely. Peel the oranges using a sharp knife as follows: cut off the top and bottom. Then cut the skin away and remove any remaining pith. Cut between the membranes to segment. Slice the halloumi in 1cm thick slices. Scatter the sesame seeds over a small plate and press both sides of the halloumi slices into the sesame seeds so that they stick. Place a pan on the stove on a medium (to low) heat and add a little olive oil. Fry your pieces of sesame-crusted haloumi until the seeds are golden brown – about 3 to 5 minutes each side. Make the salad dressing by mixing the oil (see quantity above) and vinegar together in a mug. Add salt and pepper to taste. Make the salad by tossing the sliced radish, sliced cucumber, orange segments (and any juice), rocket leaves and watercress in a large bowl. Cover with the salad dressing and toss lightly. 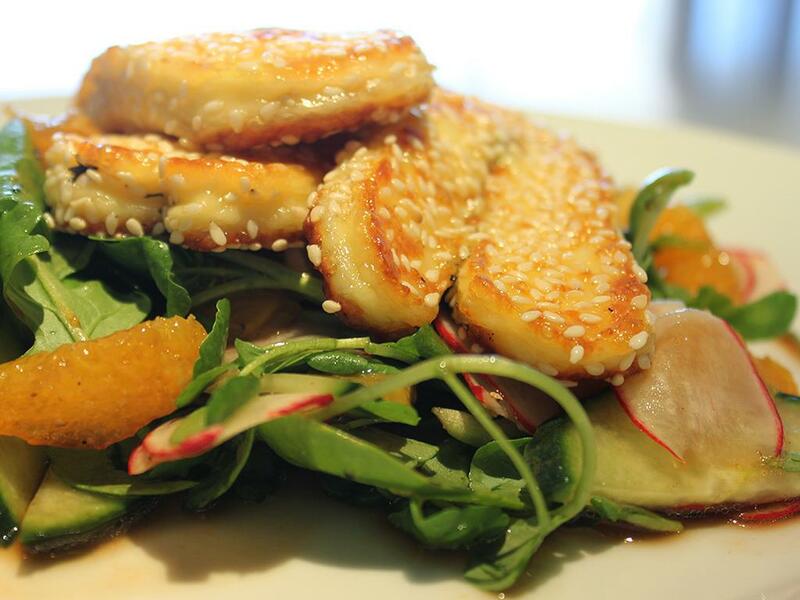 To serve, place the salad on the plate and top with sesame halloumi slices. "I absolutely loved this dish! I would not have put these ingredients together necessarily but it works - amazingly! Yummy, yummy, yummy! "